This most traditional of slow-cooked British classics is a corker of a one-pot winter warmer. For the stew, wrap the cloves, cinnamon and star anise in a clean piece of muslin and secure well. Set aside. Sprinkle the flour onto a plate and mix in the salt. Dredge the beef pieces in the seasoned flour, shaking off any excess. Heat the oil in a large, heavy-based, lidded, flameproof casserole over a medium heat. Add the beef in batches, frying for a few seconds on all sides, or until browned all over. Remove from the casserole using a slotted spoon and set aside in a bowl. Repeat the process with the remaining beef. Add the carrots and fry, stirring regularly, for 6-8 minutes, or until sticky and deep golden-brown. Remove from the casserole using a slotted spoon and set aside with the beef. Add the onions and fry, stirring regularly, for 6-8 minutes, or until well coloured. Remove from the casserole using a slotted spoon and set aside with the beef and carrots. Add the celery and fry, stirring regularly, for 6-8 minutes, or until well coloured. Return the beef and cooked vegetables to the casserole and stir well. Add the muslin bag and the apples and stir again. Pour in the ale, stir well, then bring the mixture to the boil. Pour in the stock, add the rosemary and bay leaves and return the mixture to the boil. Stir well, then cover the casserole with the lid and reduce the heat until the mixture is just simmering. Season, to taste, with salt. Transfer the casserole to the oven and cook for 2½-3½ hours, or until the beef is tender and falling-apart. For the dumplings, mix together the breadcrumbs, suet, self-raising flour, salt and parsley in a large bowl until well combined. In a jug, whisk together the egg and milk until well combined. Make a well in the centre of the dry ingredients, then gradually pour the wet ingredients into it. Stir the dry mixture into the wet mixture a little at a time, until the mixture comes together as a dough. Roll the dough into eight equally-sized dumplings, then set aside. When the stew has been cooking for 2½-3 hours and the meat is tender, remove the casserole from the oven and remove the lid. Dot the dumplings onto the surface of the stew, leaving space between each. 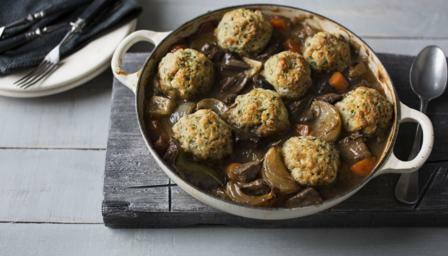 Put the lid on the casserole and return it to the oven for a further 20 minutes, or until the dumplings have expanded. Remove the casserole from the oven. Remove the lid from the casserole and brush the tops of the dumplings with a little oil or melted butter. Return the casserole to the oven. Continue to cook for a further 10-15 minutes, or until the dumplings are crisp and golden-brown on top and cooked through. Set the casserole aside for 10-20 minutes before serving. To serve, place the casserole on the table and let people help themselves.